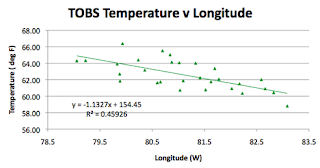 Given that it is only 260 miles by 200 miles in size, South Carolina has a lot of USHCN temperature stations, to be exact some 29 though there are no GISS stations in the state, according to the list, which makes this week's task a little easier. 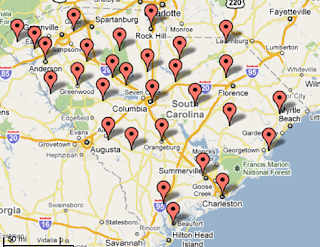 Location of the USHCN stations in South Carolina. 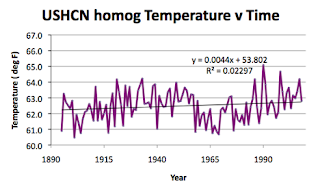 After the data from these stations has been “homogenized” to adjust for missing and other problem values, the official temperature trend for the state over the past 115 years shows an increase in total of about 0.44 deg F per century, although in similar mode to Georgia there is that odd dip that ends in 1965. 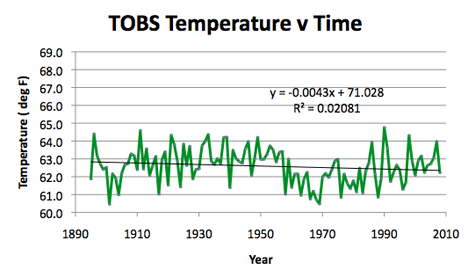 (And since we are talking about land values here it can’t have anything to do with the resurrecting debate about buckets and engine inlet methods which have been used to explain somewhat a somewhat similar dip at sea). 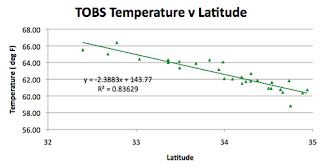 When the time of observation corrected otherwise raw (TOBS) data is plotted, the trend reverts to that negative slope which we have seen in North Florida, Alabama, Mississippi, Tennessee, Kentucky and Louisiana. 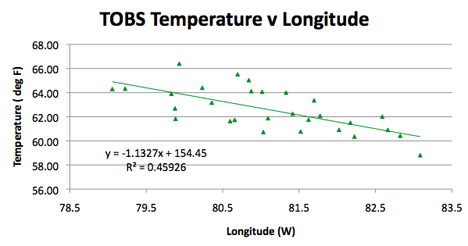 Average temperature for the USHCN stations in South Carolina, using the time of observation corrected raw data. Average station temperature in South Carolina as a function of latitude using TOBS data. This is relatively consistent with what I have found in other states, although it might be interesting after the compilation, to see how the gradients change around the country. In South Carolina the land slopes up to the West, and so we see this reflected in the change with longitude. The primary dependence on elevation can be noted, with the higher correlation coefficient as shown. 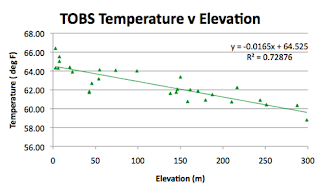 Effect of station elevation on temperature in the state of South Carolina. 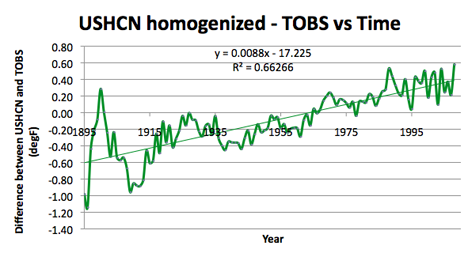 (Incidentally this also helps show why I use TOBS rather than homogenized data, since the R^2 value for the latter is only 0.44, after data manipulation). 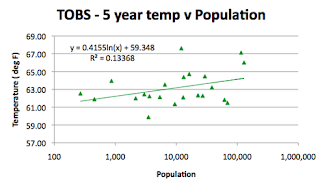 Looking at the population surrounding each station, using the information from the citi-data sites, which has all but one of the stations in the register. The one missing was Santuck, but this is relatively close to Carlisle, so I used that data instead. Also Winthrop designates a site at the university, which is itself located within Rock Hill, so I used that population. This population data is largely for 2009, but by averaging temperatures over the past 5 years, as I established in earlier posts, there is a reasonable correlation for this state. Which leaves only the plot between the raw and homogenized data, which, as you might imagine for the two plots I started the post with, looks like this when I subtract the average TOBS value from the average homogenized temperature each year. Difference between the homogenized data reported for the USHCN stations in South Carolina, and the TOBS corrected raw data.